It is common to have emotional changes after your baby is born. You may feel excited, exhausted, overwhelmed, and even sad at times. Taking care of a baby is a lot to think about and a lot to do. On top of all that, after the birth of your baby, your hormones are adjusting again. As a result, these changes can have an effect on your emotions and how you feel. Tell your partner how you feel. Let your partner help take care of the baby. Ask your friends and family for help. Tell them exactly what they can do for you, like go grocery shopping or make meals. Try to get as much rest as you can. We know it’s easier said than done, but try to sleep when your baby is sleeping. Try to make time for yourself. If possible, get out the house every day, even if it’s for a short while. Eat healthy foods and be active when you can (with your health care provider’s ok). Eating healthy and getting fit can help you feel better. Don’t drink alcohol, smoke or use drugs. All these things are bad for you and can make it hard for you to handle stress. If you experience changes in your feelings, in your everyday life, and in how you think about yourself or your baby that last longer than 2 weeks, call your health care provider right away. These could be signs of postpartum depression. 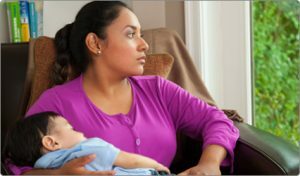 How do you know if you have postpartum depression? If you think you may have PPD, call your health care provider right away. There are things you and your provider can do to help you feel better. If you’re worried about hurting yourself or your baby, call emergency services at 911.